Kayla Kerkman, a Westosha Central senior, was named top senior infielder/catcher earlier this month (Earlene Frederick/The Report). 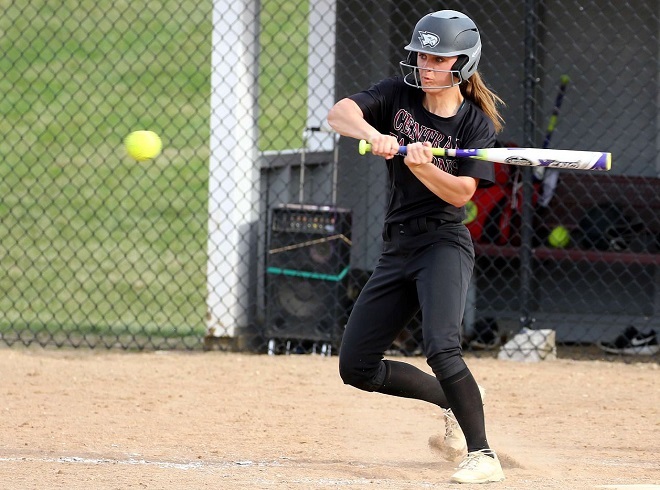 When Kayla Kerkman was named honorable mention all-district by the Wisconsin Fastpitch Softball Coaches Association as junior, little did the Westosha Central High School senior know the honor would parlay into a bigger honor, which came June 6 from WisSports.net. Kerkman, a fleet-footed slap hitter, was selected as the top senior infielder/catcher as part of the website’s senior softball awards. The senior shortstop who plans to attend Division II Winona State University was stunned by the June 6 announcement. According to Falcons co-coach Tom Lampe, who had two other top seniors, said she was on the radar screen by WisSports since the start of the season. From there, a WisSports advisory committee consisting of coaches and other officials in the state discuss players under consideration. Including Kerkman, the advisory committee narrowed the field to six finalists for the award. For Kerkman, she didn’t even know she was among the six finalists until a week before the announcement. As a senior, Kerkman established career highs in hits (51), RBIs (16), stolen bases (23) and runs (42). She batted .459 with a .933 OPS. Her 23 stolen bases set a single season school record and was an improvement from her junior season, when she had six. Kerkman, noting the Falcons history of producing power hitters, felt compelled to take an aggressive approach on the base paths her senior season. “This year, I am one of the leaders on the team, and that pushed me to set an example for the rest of the team,” she added. Setting an example, according to Lampe, has been a key leadership quality. Kerkman, whose family has a strong baseball and softball pedigree, received her first taste of varsity competition her freshman year. The taste includes helping the Falcons win the WIAA Division I state championship. Kerkman recalled scoring a run in the state championship game. The freshman year, however, came with some growing pains. Kerkman, who was batting right-handed at the time, suffered a shoulder injury. With encouragement from coaches and her family, she decided to switch her batting style, becoming a left-handed slap hitter. Lampe said her family’s strong baseball and softball background played a role in the rapid transition. Along with Ryan, who played baseball for Westosha Central, Kerkman’s two aunts played softball for Westosha Central and at the University of Wisconsin-Whitewater. Megan Kerkman LuQuesne was inducted into the UW-Whitewater Athletic Hall of Fame in 2016. Valerie Kerkman Auseth was an NCAA Division III All-American. “There is a lot of baseball and softball pedigree in that family,” Lampe said. Kerkman’s other family members include mother, Leslie, along with brothers Bryce, a Westosha Central sophomore, and Chase, who attends Randall Consolidated School. Through her four years, Kerkman found Union Grove and pitcher Brittany Moore as the most challenging, especially as a sophomore. “I’d say Union Grove my sophomore year, we beat them once, but Brittany Moore was a really great pitcher and had a great rise ball,” she said. When Kerkman arrives to Winona State, she plans to study movement science with hopes of becoming a physical therapist. She chose Winona State for the coaching staff, team atmosphere and small-town feel. “I am from Wheatland and I really like the Burlington area,” she said.